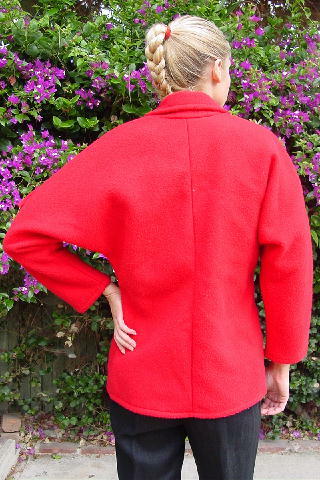 This red polarfleece jacket is by Barrie Stephens. The original double-faced fleece fabric is 100% dacron DuPont polyester. The tag says it's size Large, but it fits like a short size Small. The front has a 4" long by 1/4" wide fringe extending from uder the collar to the shoulder-raglan sleeve area. There are two lower open pockets and a two-red button front closure. It's from a young Chicago model. side to side bottom hem 18"